Larry Booth photographed much of San Diego such as Mission Valley's mid-century modern Bowlero. 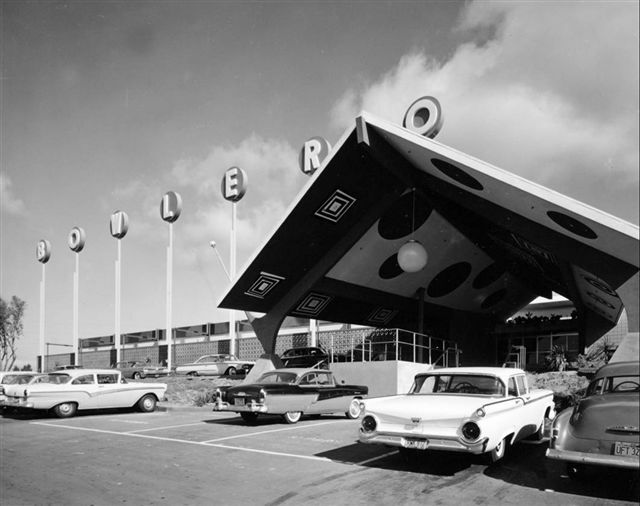 Many of his most popular images depict not only architecture but the automobiles of the day shown in this early 1960 black and white photograph. The Bowlero eventually became the Scottish Rite Center. REMARKABLE COUPLE--By Thomas Shess--The nostalgia is instant. A first glance at one of Larry Booth’s now classic photographs easily rekindles memories of what San Diego was like in the first decades after World War II. Booth up until his death in 2003 was the most recognized photo archivist in San Diego yet his personal photographic work went virtually unnoticed. Larry Booth’s personal drive to save millions of images of San Diego history since the 1870s is just one of his enduring legacies. Pioneering the science to preserve antique images is another milepost for this tireless historian. “My husband was driven to record many aspects of San Diego County from the perspective of a historian as well as a photographer,” said the late Jane Booth, who was married to Booth for more than 60 years. “Larry wanted his images to be roadmaps for future generations,” she said. --Greg Williams, Past Curator of Photography, San Diego Historical Society, now called the San Diego History Center. Larry Booth was hired after World War II by the now defunct Union Title Insurance Company to take photographs for the company magazine and to oversee the formidable collection the company had acquired. At mid-century Union Title possessed the largest collection of San Diego photo images dating back to 1870. From the late 1940s on, Larry and Jane worked hard to preserve many of these historic images from decay. Eventually, the Booths were instrumental in arranging the transfer the Union Title Photo Collection to the San Diego Historical Society. Thanks to Larry and Jane Booth the collection today has grown to more than 2.5 million images. About 10,000 of those were photographed by Larry Booth, according to Greg Williams, Curator of Photography at the San Diego Historical Society. Many of the 10,000 are remarkable. Booth’s scenic images of San Diego in the 1950s and 1960s will forever document our town—yet to the general public they have been relatively undiscovered. “While, I don’t believe Larry had any shows of his work, his work is present in nearly every San Diego Historical Society exhibition…both his photographic work and his preservation work,” said Williams, who is no longer with SDHS. In 1994, The Booth Historical Archives were named in honor of Larry and Jane Booth for their dedication in preserving and enhancing the collection. Booth’s early assignment was to provide photographs for Union Title’s in-house magazine called Title Trust Topics. The mantra of the publication was to show the diversity of the San Diego area. So many of Booth’s mid-century images portray the County’s strong points: climate, beaches, mountains, desert and industry from fishing to agriculture. UPDATE FROM THE LOS ANGELES TIMES, March 2003: "...Larry Booth, 82, former curator of photographs for the San Diego Historical Society, who built and preserved one of the best collections of local history photographs in the nation, died of cancer Jan. 20 at his home in San Diego. Booth recognized the need for preserving historical photos in the 1950s as a photographer and photo historian for what later became known as the Title Insurance & Trust Co."
Mission Valley Bowlero became the Scottish Rite Center, this one is in Lemon Grove.